These are the enlightened Muslim scholars that we should all listen to. These, among several other bans, were drafted by the CII in a 163-paged bill presented to the Punjab Assembly for review. The bill, which has raised widespread criticism was drafted in response to a women’s protection law passed by the Punjab government earlier in March – Protection of Women against Violence Act (PPWA). The CII rejected the law, declaring it un-Islamic. The independent Human Rights Commission of Pakistan termed the proposals “ridiculous,” and called for the council to be abolished. While the Punjab Law Minister, Rana Sanaullah, opposed the bill saying that Islam does not condone any form violence, be it against women or children. 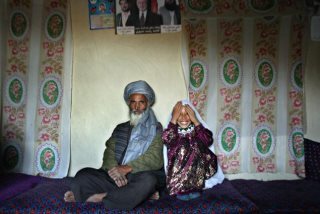 Marriage to children is a common practice among Arab and Muslim cultures. These ridiculous proposals prompted photographer, Fahhad Rajper, to begin a photo series featuring portraits of Pakistani women reacting to the bill presented by the CII, accompanied by a social media campaign with the hashtag #TryBeatingMeLightly. The campaign has since gone viral and is evolving into a movement. Pakistani women are not having it, they will not be oppressed and they made sure to voice their disapproval in a series of tweets and Facebook posts. “#TryBeatingMeLightly is an initiative to empower women amongst us, who work towards individual and collective betterment. It’s an opportunity for those to voice their opinions who can’t or don’t. The women around me, at my home, in my friend circle and in the industry that I love – like yourself,” Rajper wrote on his Facebook wall. Other ridiculous proposals in the bill include, a ban on female nurses from attending to male patients, a ban on women from working in advertisements and from welcoming foreign delegations on visits to Pakistan. In January, the CII rejected a proposed legislation to increase the country’s minimum marriageable age from 16 to 18, terming the proposal, un-Islamic. Meanwhile, they have been clamouring for a reduction in the marriageable age from 16 to 9 years old, as long as there are visible signs of puberty.